Even if your kid doesn’t eat salad— yet — I’ll bet they’d love playing with this handmade play food felt salad set ($16) by Morgan’s Mercantile. It comes with everything you see here, right down to the breadstick. Which, obviously, every good salad requires. 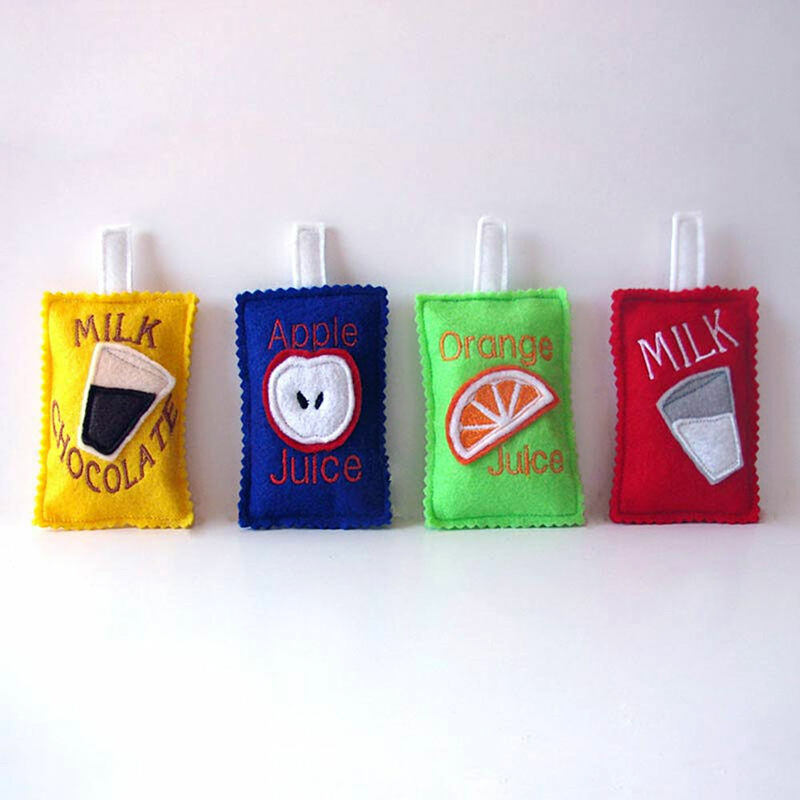 Every little chef-in-training needs some felt beverages to wash down all those felt treats. Take a look at these wonderful play food juice boxes found amongst the array of handmade play food from this Colorado Springs Etsy maker. I also love that she offers cute felt play money — should you be raising a little entrepreneur-in-training too. 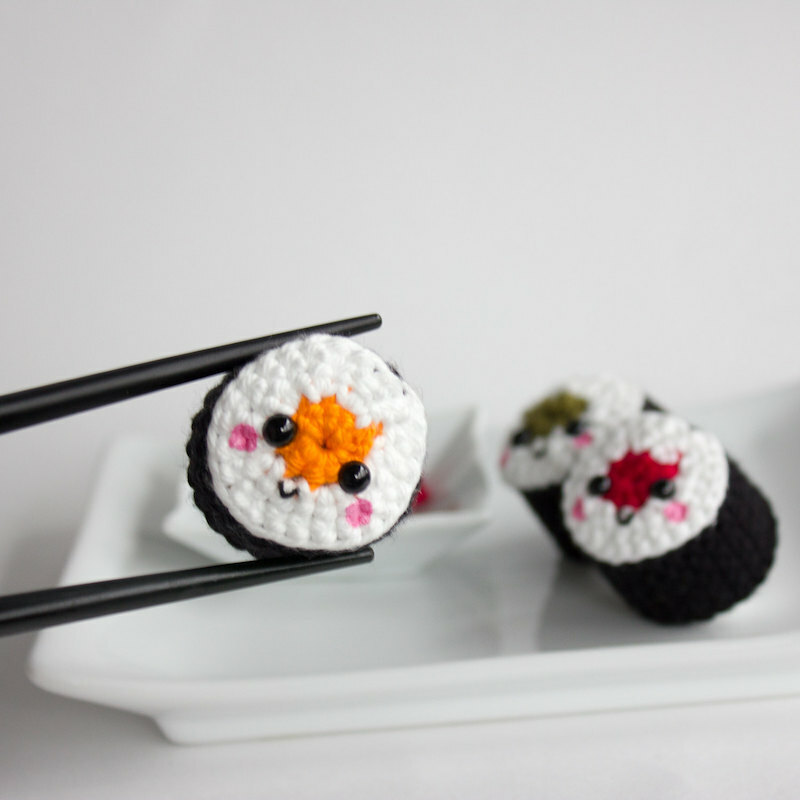 This Etsy shop makes the kind of play foods that make you say “awww….” Just look at these smiley crocheted play food sushi rolls which are way too cute and happy to eat . Which is fine, since cotton yarn is not edible anyway. So perfect for kids who love exotic play foods, and all things kawaii. 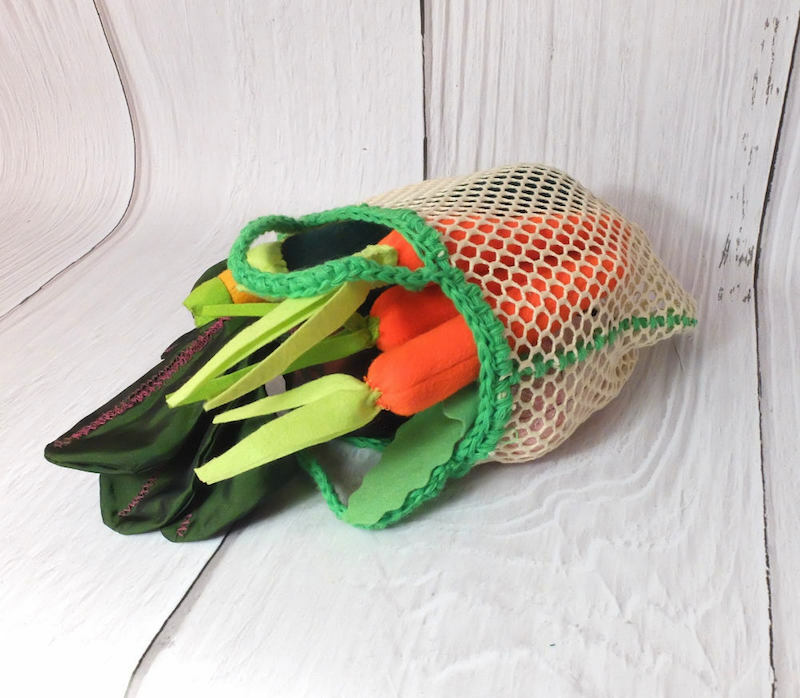 I find this handmade felt play food veggie set ($50.06) by Polish shop Florfanka especially charming, though the price makes it a very special play kitchen-ready gift. Maybe I’m drawn to the choice of handmade veggies (zucchini, carrots, turnips, beets), which are so nutritious. 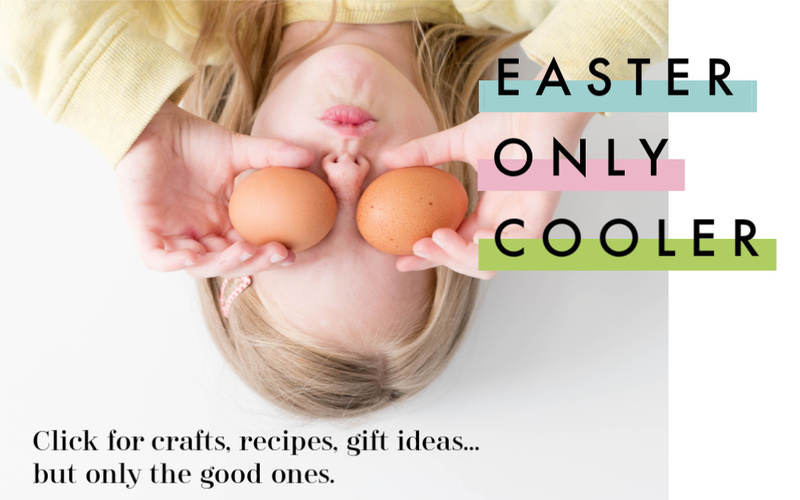 Or maybe it’s the mesh tote bag to carry them all in, which lets our kids reenact some eco grocery shopping and farmer’s market browsing, European style. 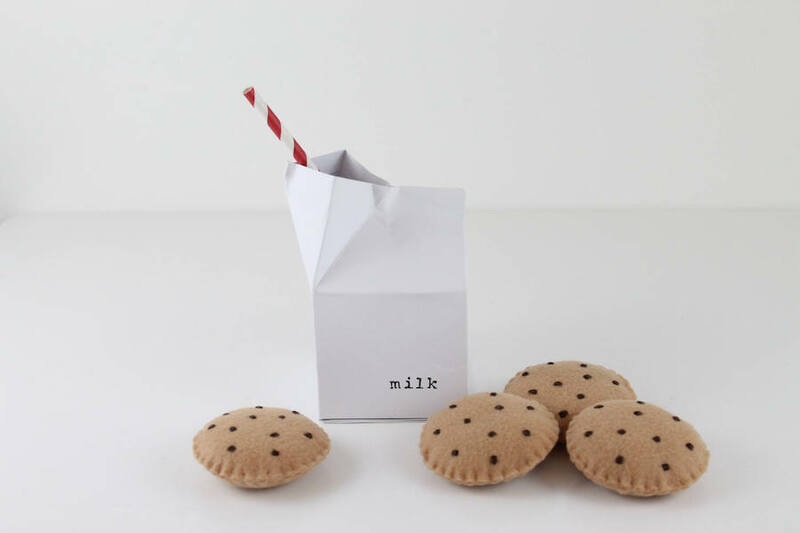 This Wisconsin-based, Martha Stewart American Made-approved maker captures everything that’s beautiful about the milk and cookies ritual with this set ($12.50) of handmade play food treats. It comes with four felt cookies, an (empty, thank goodness) milk carton, and even the world’s most perfectly striped straw. 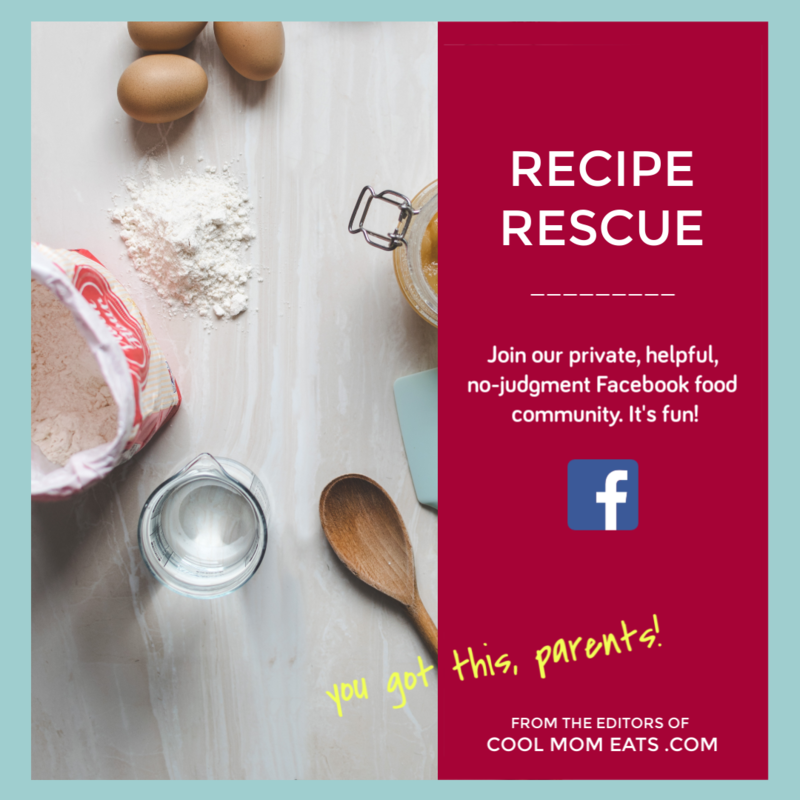 Be sure to check out her site for a ton of other really wonderful handmade play food, including an entire play food Thanksgiving dinner! Ireland’s Lil’ Crochet Love serves up the cutest crocheted handmade treats, including donuts, cupcakes, and smiling amigurumi fruits. 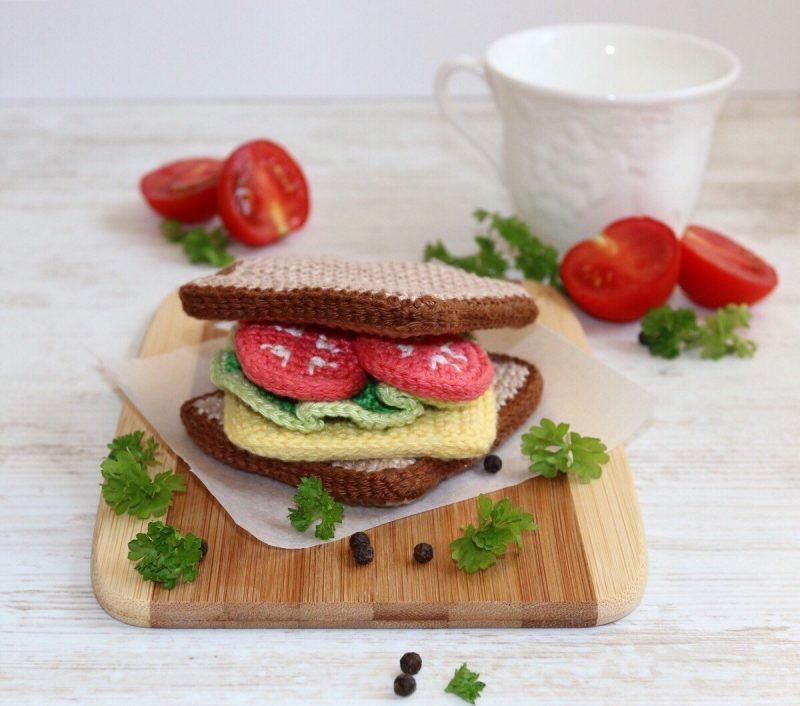 But I am drawn to this handmade play food sandwich set ($23.75) which comes with all the fixings, which means you’re in for lots of pretend eating of made-to-order sandwiches. But that’s not a bad way to spend a lunch hour at all, is it? 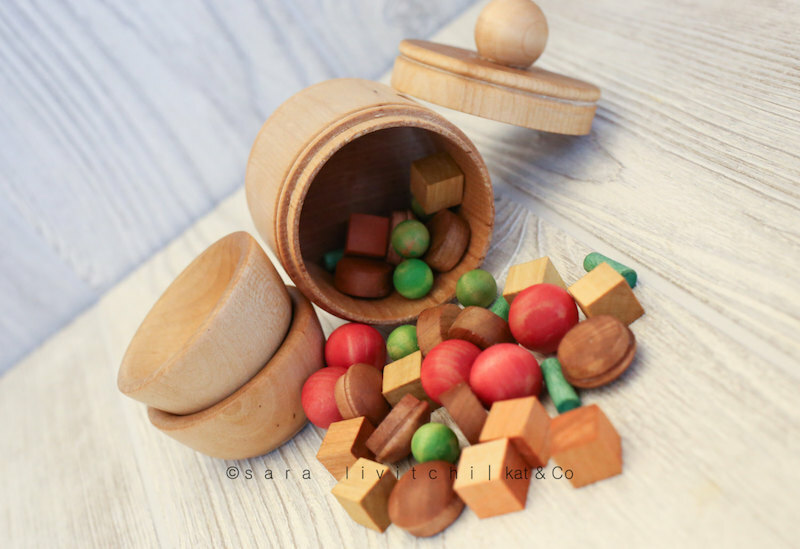 There’s something to be said for simplicity, which is what Kat and Company’s wooden play food soup set ($20) offers beautifully. The basic shapes are so good for preschoolers to identify, like round peas, cubed potatoes, and straight green beans. Plus, they all come in a handmade pot, which helps keep a lid on (heh) any pieces going missing. Just be sure to save this one for kids over 3 because the components of this adorable handmade play food are small!